Teknisk ansvarlig i DTNorway, står for websider, trykksaker og andre produksjoner. Fan siden 1996. Involvert med fanklubben siden 2002. Har bl.a. produsert "A Walk Beside The Band" - fanklubbdvden fra 2005. Jobber til daglig som IT-konsulent i Oslo for et større konsulenthus, med fokus på Business Intelligence og Datavarehus-systemer. Familiemann (kone, to barn, og bikkje), med bosted i Drammen, og stor samler av medieutgivelser, da spesielt DVD/Blu-ray og tv-spill. Progressive metal veterans DREAM THEATER have announced BLACK CLOUDS & SILVER LININGS as the title of their tenth studio album. The band commenced work on the album – their second for Roadrunner Records, following up 2007’s Systematic Chaos — in October of last year. New York, NY: Few bands inspire such fanaticism among their fans as Dream Theater. The best way to satiate this dedicated legion is to provide them with even more material to devour and Dream Theater are doing just that this September. The band will release Chaos In Motion 2007/2008, which documents their «Chaos In Motion» world tour, which kicked off June 3, 2007 at the Monsters of Rock Festival in Milan, Italy and concluded almost a year to the day later on June 4, 2008 in San Juan, Puerto Rico. It’s essentially a travelogue of their most recent touring experience and it hits shelves on September 23. Chaos In Motion 2007/2008 will be available in two configurations: as a double DVD set and as five disc collector’s set which includes two DVDs and three CDs, containing 14 live tracks featured in the DVD set and expanded artwork. The Chaos in Motion Tour was a trek that found the band traversing the globe, playing 115 shows in 105 cities in 35 countries on five continents to hundreds of thousands of fans. It also included the first annual Progressive Nation Tour, an idea that the band had kicked around for a few years and finally launched into action this past spring. Chaos In Motion 2007/2008 is the latest in a series of DVDs from the band and it features performances captured throughout the entirety of the tour, unlike their last three RIAA-certified Platinum DVDs, Metropolis 2000: Live Scenes From New York, Live at Budokan and Score, all of which focused on as single concert event. Drummer and DVD creative director Mike Portnoy plumed his personal archives for footage in order to provide fans with the ultimate tour souvenir. He assembled over three hours of complete live performances, taking footage from shows in Rotterdam, Buenos Aires, Toronto, Boston, Bangkok and Vancouver. The tracks were mixed and effectively brought to life by Kevin Shirley. The second disc is packed with bonus material, including promo videos, live screen projection films, a photo gallery and a 90-minute documentary that’ll make you feel like you’re riding in the passenger’s seat of the band’s tour bus, as it takes you on the road and behind the scenes with the band and crew. It’s like a virtual backstage pass that grants fans further unprecedented access. 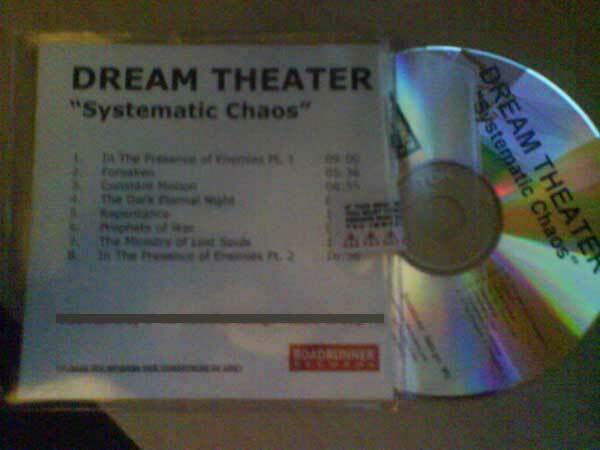 Indeed, Chaos In Motion 2007/2008 is a completist piece that will keep Dream Theater diehards satisfied until the band takes to the road again.